The Avocent SwitchView SC8 DVI KVM (SC8PDV-001) switch is designed specifically for secure environments and is the only KVM switch that is NIAP Common Criteria validated to EAL 4. It supports eight secure channels, dual DVI-I video connections and provides the highest video resolution available in a secure KVM switch: 2560x1600 @ 60Hz. 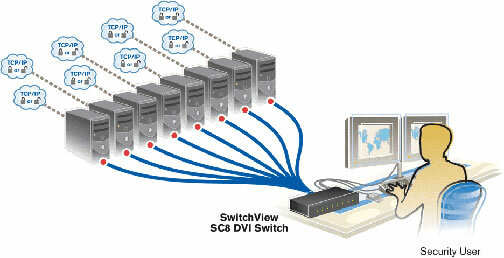 The SwitchView SC8 DVI switch has eight secure channels, which allow you to increase the number of security levels you can monitor. Keyboard, mouse and DVI digital video signals are channel isolated to over 60db. With the Avocent SwitchView SC8 DVI KVM (SC8PDV-001) switching system, you can safely switch between as many as eight computers operating at different classification levels, all from one keyboard, monitor and mouse. NIAP Common Criteria Certification - The SwitchView SC KVM switching system is the only KVM switching system to achieve international NIAP agency approval. The Avocent SwitchView SC8 DVI KVM (SC8PDV-001) switch is NIAP Common Criteria validated to EAL 4. Dual-head DVI-I video - Each of the eight secure channels supports dual-head DVI-I video connections to provide the highest video resolution available in a secure KVM switch. DVI-I video connections support digital and analog video. Digital video supports a maximum resolution of 2560x1600 at 60Hz. I/O processors for access to CPUs connected to networks of varying classification levels. Custom-designed firmware - encrypted and internal. Standard PS/2 protocol - standard PS/2 protocol is maintained to avoid the possibility of any external device detecting the presence of the SwitchView SC KVM switch. Clears buffer - automatically clears the keyboard buffer immediately after data is transmitted through the switch, so no data is ever left in the switch. Multi-server support - securely access up to eight attached servers using just one keyboard, monitor and mouse.